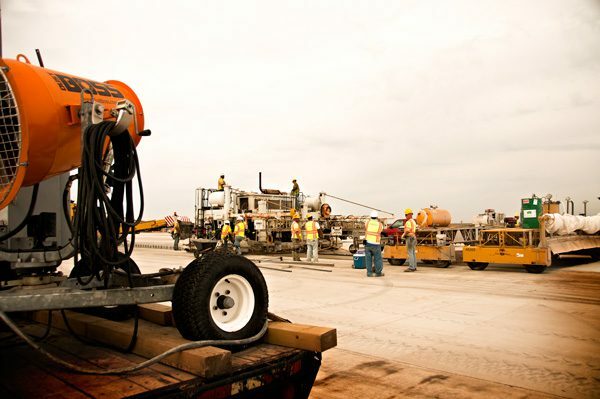 One of the nation’s most experienced builders of military and commercial airfields has found an innovative new method of retaining moisture in large concrete paving applications to maximize cure and surface durability. 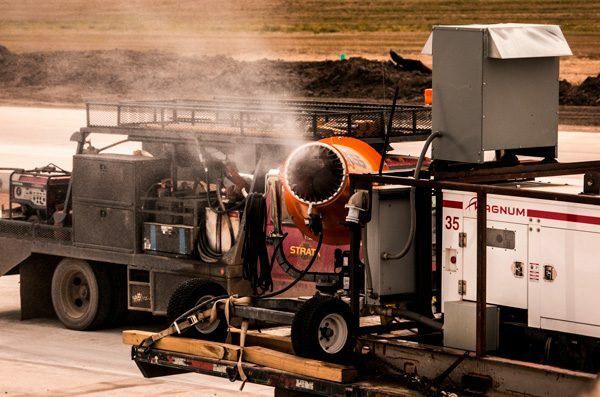 Strata Corporation (Grand Forks, ND, USA) used atomized misting equipment to raise humidity levels while paving the immense runway area at Minot Air Force Base, allowing the company to work even on hot summer days, while adhering to strict Army Corps of Engineers (ACE) guidelines. Demolition and reconstruction of the 450,000 square foot runway surface was part of a $70 million multi-phase program at the facility. Minot AFB is located about 21 km north of the city of Minot in Ward County, North Dakota (USA). Spread over an area of approximately 5,000 acres, the base is home to 13,000 people, including military personnel and families, Department of Defense civilians and retired personnel. It houses the 5th Bomb Wing and 91st Missile Wing of the Air Force Global Strike Command. “The concern was over moisture loss during the finishing and texturing process on hot, dry days. But it's unacceptable to spray the surface directly with water." The base has a single 2.5-mile concrete runway (4,022 meters), which can accommodate a range of aircraft that includes the B-52H Stratofortress, C-130J Hercules, C-17 Globemaster III and A-10 Thunderbolt II. The massive concrete pour was conducted under ACE regulations for temperature and humidity to obtain maximum strength and longevity, but the hot, dry weather of the past summer complicated Strata’s efforts. The Corps of Engineers’ concrete paving specifications required a concrete curing temperature of less than 90 degrees. However, when the humidity is between 40 and 60 percent, the maximum allowable concrete temperature is 85 degrees, and when below 40 percent humidity the maximum drops to just 80 degrees. There are several methods used to maintain moisture in the concrete as it cures. On this project, Strata coated the surface with a pigmented compound after finishing and texturing was complete. But with little tolerance for variation from the specs, Erickson and his crews wanted to be absolutely certain that they achieved the required curing conditions. “The concern was over moisture loss during the finishing and texturing process on hot, dry days,” he said. "But it's unacceptable to spray the surface directly with water. If water is directly applied to the concrete and finished into the surface, the result is a much less durable concrete that is susceptible to many defects." The moisture issue initiated Strata’s search for equipment that could raise the humidity around the pavement, without significantly increasing the water-to-cement ratio at the surface of the concrete being poured. Through Internet research, Quality Control Manager Phil Clouse found information on the DustBoss family of equipment. Designed for dust suppression, he learned that the equipment was capable of producing millions of atomized droplets per minute from its specially-designed brass nozzles, then launching them over long distances with a powerful fan. Wanting to minimize the volume of water used to avoid surface saturation, Clouse looked at the smallest of the ducted fan designs, the DB-30. Mounted on a movable carriage, the versatile, direct-drive unit has a 7.5 HP motor that generates 9,200 CFM (260 CMM) of air flow. The design has an adjustable throw angle from 0-50° elevation and standard oscillation up to 70°. With a range of 100 feet, it delivers exceptional coverage of a 5,500 square foot area (510 square meters) from a 5/8" garden hose. When equipped with optional 359° oscillation, the DB-30 can cover more than 30,000 square feet (2,787 square meters). Impressed by the performance of the two machines, Clouse decided to purchase one of the units at the end of the rental period, giving the firm ready access to the technology for future jobs. “We found the DustBoss units were a valuable tool, and I anticipate buying more in the future,” he said. Raising humidity levels on large concrete pouring applications for optimum curing. Two DustBoss 30s (DB-30), mounted with a generator on a trailer and towed by a water truck. The higher humidity levels allowed the Strata crews to meet stringent Army Corps of Engineers specifications, even on hot summer days. The DB-30s replenished surface moisture lost through evaporation, increasing humidity behind the paver by as much as 15%. This entry was posted in Concrete Curing, DB-30, Demolition, DustBoss, News, Rentals. Bookmark the permalink. Both comments and trackbacks are currently closed.